In a statement today, Sony announced that they captured the #2 spot in the U.S. Interchangeable Lens Camera market, as of the end of February, based on sales data analysis from the retail analysis firm NPD Group. The report is ranked on U.S. dollars spent from January through February 2017, where the company saw a 23% growth in sales compared Year Over Year. 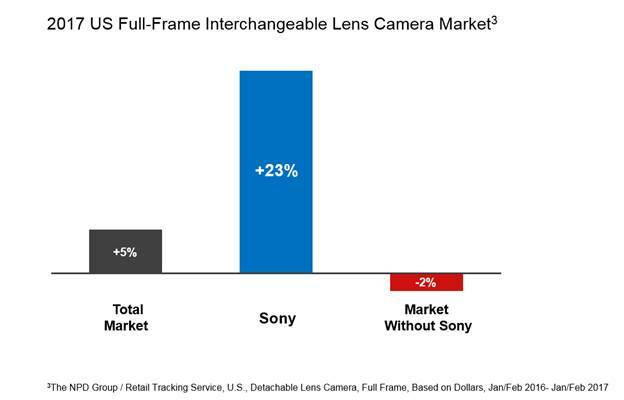 The statement also indicates that the increase in demand for Sony’s products has increased the overall full-frame ILC market, which grew by 5%, and would have, according to the statement, declined instead by 2% in the same period if Sony were not factored in. Sony attributes the sales numbers in part to the a7RII and a7SII cameras. The report doesn’t indicate which manufacturer was displaced in the number two spot, though the first and second spots are usually held by Nikon and Canon, respectively. It is important to note that this is based on U.S. Dollars not Unit Sales and Sony has released no data about unit sales figures for the same period. Sony’s figures released for total market share in Jan-Feb 2017.